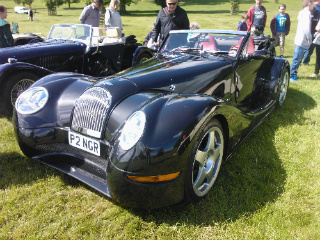 The Morgan sports car. During the 1930's, a range of Morgan Three Wheelers were introduced which, after suitable development, evolved into the Aero and Sports models. They used a modified motorcycle engine which was cooled either by air or liquid. The engine was positioned ahead of the front wheels. Production of these V-Twin models ended in 1939. 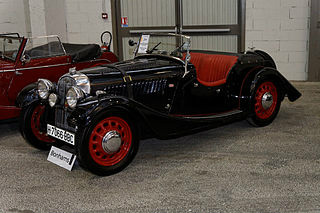 In 1932, the F-series of Three Wheeler sports car was introduced, with the F4. It used a new steel chassis, a 4-cylinder Ford engine, and a four seater body. A two seater F2 came in 1935, and a sporty F Super in 1937. Production of Three Wheelers ended in 1952. The first four wheeled Morgan appeared in 1936, and was designated the Morgan 4-4 Series 1 (meaning 4 cylinders and 4 wheels). Manufacture of both the 4-4 and Three Wheelers continued until 1952. 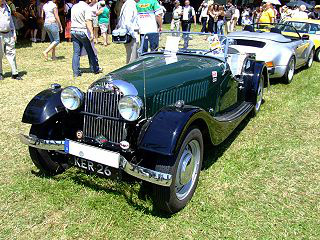 The Morgan 4-4 two seater was built between 1936-1950. 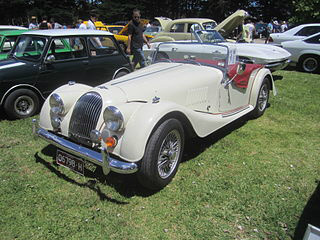 The Morgan 4/4 Series 2 sports car was introduced in 1955. It was a two seater with a three speed gearbox. 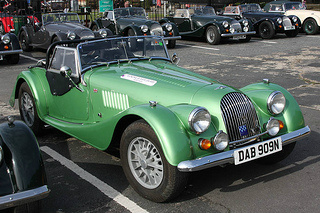 Similar in appearance to its predecessor, there were a number of changes, including use of the Morgan Plus 4 chassis. The Morgan 4/4 Series 3 sports car was launched in 1960. The 1172 cc Ford side valve engine, fitted to the Series 2 car, was now replaced with the Ford 997 cc, 105E overhead valve unit, as used in the Ford Anglia saloon. It was fitted with a single Solex carburettor. Furthermore, the previous Ford three speed gearbox was now replaced by a Ford four speed unit. 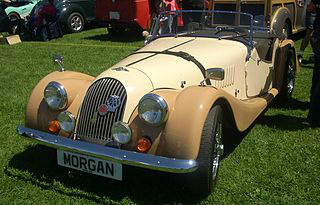 The Morgan 4/4 Series 4 sports car was introduced in 1961, and was fitted with a 1.3 litre, overhead valve Ford engine, with a four speed gearbox, as used in the Ford Consul Classic saloon. Still fitted with a single Stromberg carburettor, it developed 62 bhp at 5000 rpm, an increase of 23 bhp over the Series 3 variant. 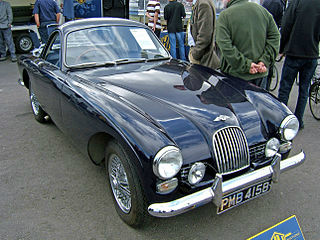 Also, in February 1961, the Morgan Plus Four Super Sports was launched to an expectant market. It was fitted with a modified 2138 cc, 4-cylinder Triumph TR2 engine, with two twin choke Webber 42DCOE carburettors, which developed 125 bhp at 5500 rpm, and produced a top speed of 118 mph. 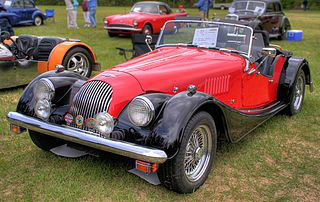 It was, in essence, a Morgan Plus Four that had been modified following requests for a road version of Chris Lawrence's 1959 successful competition car. The Morgan 4/4 Series 5 sports car was launched in 1963. It was powered by the Ford 116E, 1.5 litre, overhead valve engine, as used in the Ford Cortina saloon, together with a Ford four speed gearbox. Fitted with a single Stromberg 33VN carburettor, it developed 65 bhp, and 86 ft/lbs of torque. The competition variant produced a top speed of 98 mph. 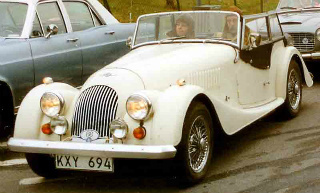 In 1964, a version of the Morgan Plus 4 was introduced, and was designated the Morgan Plus 4 Plus. It was a two seater coupe with a fibreglass body, giving it both lightweight and reduced drag characteristics. However, it did not sell since the use of fibreglass instead metal moved away from the Morgan concept, and alienated many ardent followers. In 1968, the Morgan 4/4 1600 sports car was introduced. It was offered as a two and four seater convertible. 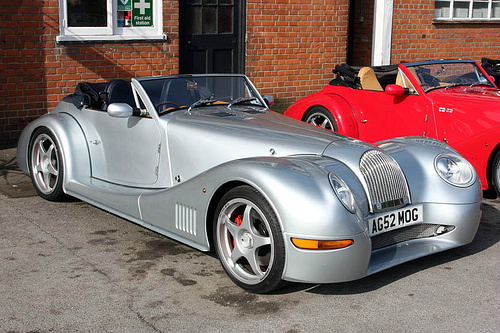 In May 1993, the Morgan 4/4 1800 was launched. The previous Ford 1597 cc, fuel injected CVH engine, was now replaced by a Ford 1796 cc, 4-cylinder, 16 valve, Zetec engine. Using a Ford five speed gearbox, output was increased from 100 to 114 bhp at 5750 rpm, which produced a top speed of 111 mph, and a 0-60 time of 7.8 secs. Production of this variant ended in 2006. 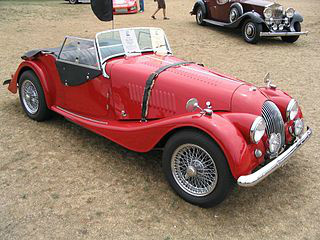 In 1950, the Morgan Plus 4 sports car was launched. It used the larger (hence the plus) 2.1 litre Standard Vanguard engine, whilst the 4-4 used a Standard Special 1267 cc unit. In 1953, the 1991 cc Triumph TR3 engine was added to produce a higher performance model. 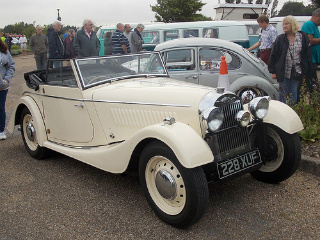 Two and four seater convertibles and drop head coupes were available. The Early Morgan Plus Four covered the period 1954 to 1969, which included the transition between the model being powered by the original 2088 cc Standard Vanguard engine, and the later range of Triumph TR2 to TR4A units. The Later Morgan Plus Four referred to the period 1969 and 2000 during which the Triumph TR powered model was replaced by a similar sized unit sourced from both Fiat and Rover. It also represented the final demise of the Plus Four, and its ultimate reincarnation in the form of the Morgan Plus 8 sports car. By 1968, the growing unavailability of large four cylinder engines caused Morgan to add the Rover 3.5 litre, V8 unit with two SU carburettors, into the Plus 4. 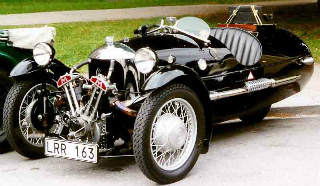 Hence, the Morgan Plus 8 was born. The Early Morgan Plus 8 sports car covered the period between its introduction in 1968, and its ensuing developments up to the point at which , in 1987, all Plus 8's were fitted with Bosch fuel injection. This represented an important milestone. In 1990, a 3.9 litre version of the Rover engine, with Lucas fuel injection, was added to the Plus 8. 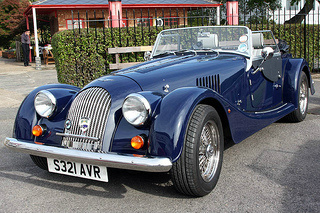 The Later Morgan Plus 8 sports car covered the period between the introduction of fuel injection to all Plus 8's in 1987, through the various technical developments, to the final demise of the model in 2004. In 1997, the car was offered, as an optional extra, with a 4.6 litre, fuel injected engine, which developed 220 bhp, and 260 ft/lbs of torque. This produced the highest performing Plus 8 sports car with a top speed of 128 mph, and a 0-60 mph time of 6.0 secs. During the period 1950's to 1960's, almost all sports car production was exported to the US. Following a halt in exports due to US emission control regulations, from 1974 to 1992, exports to the US of Plus 8 sports cars had their engines modified, by local dealers, to run on propane gas. In this way, there was no infringement of emission regulations. Exports to the US finally ended in 2004 when the Plus 8 was discontinued. Got any stories about Your Favourite Morgan Sports Car?